Your training plan is stuck to the fridge, you’re wearing in your new trainers and your running playlist is as ready as you are. When it comes to competing in running events, whether you’re doing a marathon or your first 5k, it’s all in the preparation – to make sure you can run in comfort on the day and to help limit any damage for when you swap your trainers for summer sandals. With the start line in sight, here’s how you can help to ensure you put your best foot forward when the pistol fires. your training – or slow you down in the race itself. 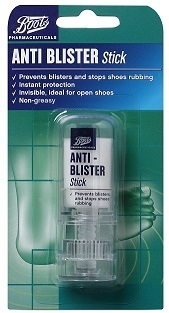 The Boots Pharmaceuticals Anti Blister Stick (£3.89) is a great way to prep your feet for any long distance event as it provides instant protection to help prevent blisters and stop shoes rubbing. For immediate relief simply apply our invisible stick formula wherever you need it. 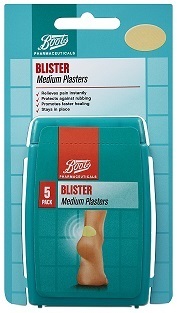 If you are unlucky enough to get blisters, or see red skin before a blister has formed you may want to try the Boots Pharmaceuticals Blister Plasters (5 pack, £4.19). The soft ionic gel provides a thick cushioning effect to help prevent friction with sensitive skin surrounding the blister. The plasters stay in place and relieve pain instantly. 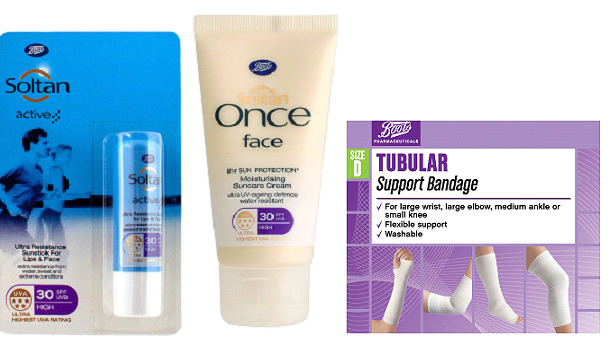 You’ve raised the money and got someone cheering from the side-lines – and Boots has got it covered when it comes to support of the more literal kind! 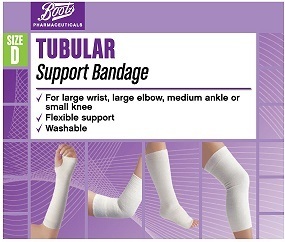 Boots Pharmaceuticals Tubular Bandage (various sizes, £3.49) provides flexible support for large knees and medium thighs. The bandage is quick and easy to apply and stays in place without tapes or pins. It is hand washable for repeat applications. 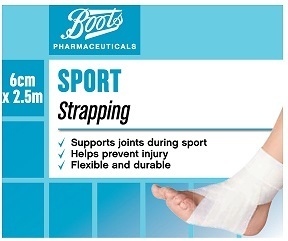 Boots Pharmaceuticals Sports Strapping (2.5m x 6cm, £6.19) is designed to support and protect joints during sporting activities and to help prevent injuries occurring. This bandage is flexible, durable and breathable. When it comes to achieving your personal best, it’s all in the detail. Make sure you’ve got your hands on the essentials to take with you on race day. Suncream is a must have if the weather is set to be sunny – and a good idea even if it’s a grey day as UV can penetrate through clouds. Choose one that will last the duration of the race so you don’t need to re-apply half way round the course! 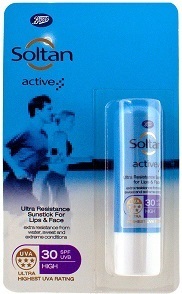 Soltan Once Face Moisturising Suncare Cream SPF 30 (50ml, £9.00) provides eight hour protection from the sun. All Soltan sun protection products have been awarded a maximum five-star rating against deep-down skin damage caused by UVA rays. A good lipbalm can help keep chapped lips at bay and help to make you feel hydrated. For extra protection choose one with an SPF such as Soltan Active Ultra Resistant Sunstick for Lips & Face (£3.50) which provides continuous moisturisation to help combat the drying effects of the sun and cold. Choose a pair of sunglasses that will feel comfortable for the duration of your run while also providing full protection from the sun’s glare and UV rays – such as the Boots Ladies Polarised Brown Wrap Sunglasses (£28). Polarised lenses offer great advantages including helping to reduce glare and improving comfort and visibility. Running4Women trialled these products and found them all to be very essential and very useful, we can conclude that all runners should have these products at their disposal. Stay Feet Fit with these Exercise Essentials from Foot Expertise!